If you’re looking for a high-quality toaster oven, the Breville Smart Oven won’t disappoint. These toaster ovens do a lot more than toast. Even though this smart oven sits on your counter it is definitely more like an oven than a toaster. 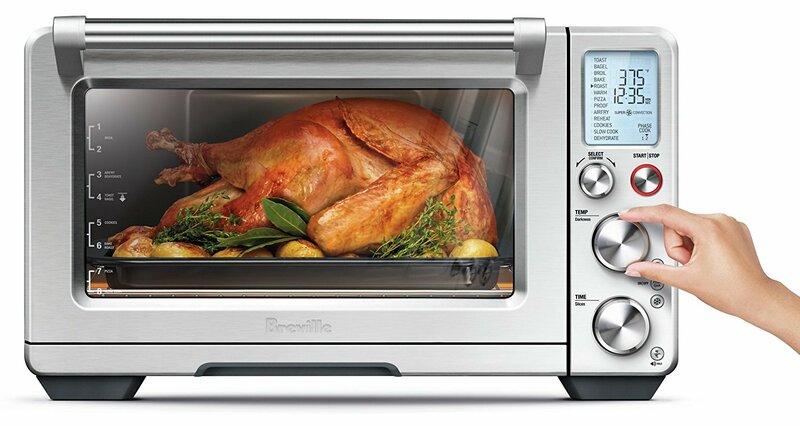 You can roast and bake in a Breville Smart Oven just like you would with a larger wall oven or range. With the five different Breville Smart Oven reviews here, you’ll see different cooking functions for each model. In a hurry? Need a Breville Smart Oven now? ⇒ See today’s price on the Top-Rated Breville Smart Ovens, Click Here. Why do I need a Breville Smart Oven? Why is the Breville Smart Oven better than a cheaper toaster oven? What is Element IQ on Breville Smart Ovens? When you first look at the Breville Smart Oven models they look quite similar. Let’s face it, they’re all ovens and they all cook your food! However, if you do some research you’ll start to discover there are important differences between the models. Breville has done a good job providing different features and size options that consumers want. 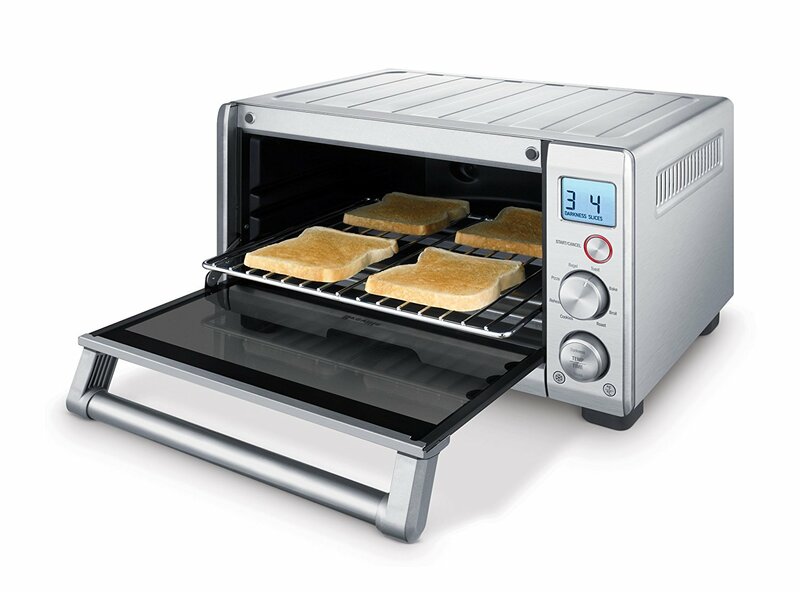 ⇒ For an excellent price on the Breville Mini Smart Oven, Click Here. Obviously, these smaller ovens are great if you’re living in an apartment and the size of your kitchen is limited. Or, if you’re renting you may not have the option of installing an oven. But these ovens are not limited to apartments. I know several families that love using their Breville Smart Ovens and they each have a good size kitchen with a high-end oven. The advantage of a toaster oven is that you can place it on your counter for easy access. I use mine several times a day because I don’t have to lean down to my range oven. And the preheating time is very short compared to my regular oven. There’s no need to waste all that electricity if I’m only roasting a few potatoes or cooking a few chicken tenders from a frozen packet. ☑ This specific Breville Smart Oven is the most popular with our readers. At the regular price it’s good value but I’ve seen it on SALE occasionally. If you can get this Smart Oven for under $160 grab it. That’s a good deal. Check current price here. And if you’re short on counter space, see this Breville bamboo cutting board. It sits on top of the Breville Smart Oven and you can place things on top of it. The cutting board has silicone feet to insulate it from the heat of the oven. Perfect for storing items on top of your smart oven. If I’m heating bagels for breakfast I can do it easily and fast. I can keep an eye on what’s cooking easily on the counter and there’s no need to strain my back getting to the oven. When I reheat left-overs for lunch I use it so I don’t need to heat up the whole house during summertime. The range oven generates a lot more ambient heat. Having an open plan house means the heat not only affects the kitchen but the other living areas too. If I’m making pizza for dinner for the kids it’s easy in the Smart Oven because it’s fast and, as already mentioned, I don’t need to get down to the range oven. If you’re looking at Breville Smart Oven reviews you may be wanting to do more than just toast in your toaster oven. You can also roast in the Breville Smart Oven. This is a great feature but it really depends on how large the meal is that you’re roasting. If I’m roasting a large dinner for the whole family I’ll use the larger oven in the range in my kitchen. But if you’re cooking for a couple or for yourself you’ll love roasting in the Breville Smart Oven and if you get the largest model with the most features, the Breville Smart Oven Air, you can do a lot more than just roast. It’s so convenient. See the Breville Smart Oven reviews below to see what size and features are best for you. I know of families who love their Breville Smart Oven because it is easy for their teenage kids to prepare meals themselves. Personally, my kids are not old enough to be doing this yet but I can see how it would offer independence to older children. The outside of the Smart Oven still gets very hot (like any oven) but if you’re kids are old enough to be responsible about cooking then the Breville Smart Oven lets them prepare meals instead of grabbing unhealthy snacks. Whether they’re heating left-overs or making a quick grilled cheese, you do get convenience. And if you want to keep the cleaning to a minimum, buy a cheap toaster oven liner which can be cut to size and makes clean up a breeze (click the image to see the price). If you’re looking at Breville Smart Oven reviews, you’re probably wanting a higher quality counter-top oven. If you’ve owned a cheap toaster oven before you’ll know they are good for toasting bread but not much more. I previously tried baking cupcakes in a cheap toaster oven and it took so long and the heat was so uneven that I knew I couldn’t rely on using it for baking. The reason it performed so poorly was obvious. The heating elements were of a cheaper quality. The heat didn’t circulate or transfer evenly to the food. And the cheaper one didn’t hold the heat. Cheap toaster ovens still have their purpose. They’re great for doing basic toasting. But if you want to use your toaster oven to do more, then you’ll notice a huge difference using a Breville Smart Oven. Compare these Breville Smart Oven reviews to see all the features available. When I want to eat something different for dinner to what the kids are having I can easily cook a steak or a piece of fish in the Smart Oven for one or two of us. The heat is even, it cooks quickly and there’s no need to waste electricity heating a large oven for only one or two serves. And if you want to replace your regular kitchen oven, try the Breville Smart Oven Air BOV900BSS. It can do almost everything. Sure, it’s slightly smaller than a big oven, but you can still roast a 14lb turkey in it and it takes a 5.5qt Dutch Oven. In the Breville Smart Oven Air you can also use a 12 cup muffin tray or a 13 x 9 inch quarter sheet pan. If you’re roasting meat you want to be sure you’re cooking at the correct temperature, not only to get a great result but also for food safety. The Breville Smart Oven has temperature control so you can select what you need for your recipe. You also get Element IQ which is a patented feature on Breville Smart Ovens. The Breville Smart Oven is a high-quality appliance. The heat circulates evenly using quartz elements and the door seals properly. There are preset cooking functions to make cooking easy and the wire rack height is adjustable. This is especially important if you’re broiling food. Depending on which model you buy, the wire rack will automatically eject when you open the oven door, using a magnetic auto-eject function (see the Breville Smart Oven Reviews on BOV800XL, BOV845BSS and BOV900BSS below). At first I assumed Element IQ was just another gimmicky word with no substance to try and help Breville’s marketing department! Now that I’ve researched it, I realize it’s more than just words. The advantage of Element IQ is that it’ll automatically adjust the power and calculate the cooking time. You can also manually adjust the time and temperature for the preset programs for your own preferences and the Smart Oven will remember the new settings for next time. 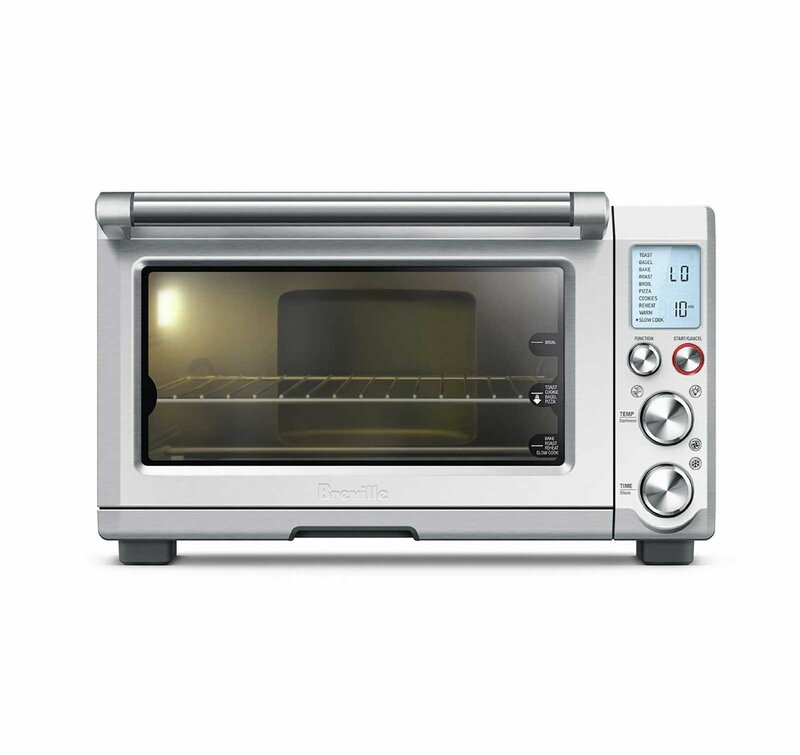 While most ovens use a fixed wattage element and they can only turn on or off, the Breville Smart Oven can vary power by increasing or decreasing the power. This ability to vary power is more like a dimmer light switch compared to an ordinary light switch which can only be on or off. The elements in Breville Smart Ovens are quartz rather than the metal elements found in other ovens. Quartz responds more quickly to heat change and this gives you more even heating throughout the oven. Breville Smart Ovens use the patented Element IQ heating system in all models of their smart ovens. Element IQ adjusts the heat or time automatically to suit your food. For example, if you have the Smart Oven on the bagel setting it will automatically adjust the power of the cooking elements. The top elements cook at a higher temperature than the bottom elements to ensure the inside of the bagel is crisp while the crust is only lightly toasted. As well as the heat, Element IQ will also automatically adjust the cooking time. For example, if the Smart Oven is already warm after one cycle of toasting then the toasting time for the second cycle will be less. This is great if you’re doing multiple batches one after the other in the oven. Do I need to do anything for Element IQ to work? Most Breville Smart Oven reviews won’t explain this, but…for the Element IQ feature to work correctly you need to select the right preset function for the food you’re cooking. Obviously, this “smart” cooking still needs a frame of reference. If you tell the oven you’re baking cookies when you’re actually roasting chicken, it’s not going to work. Element IQ will use the most efficient way to cook your food based on the setting you select. Depending on which Breville Smart Oven you choose there are 8 to 13 preset cooking functions available. Breville’s Element IQ gives you superior cooking results. By adjusting the temp and/or cooking time automatically you can get consistent results. With cheaper toaster ovens we all know that if the temperature is too high you end up ruining your food. And if it’s too low it takes forever to cook. There are plenty of settings to choose from on each Breville Smart Oven so you can choose what you need easily. If you’re cooking more than toast, you’ll appreciate the Element IQ feature day-after-day. Breville Smart Oven is the sort of appliance that you’ll end up using more than you think. I love kitchen appliances that give me convenience. The advantage of the Breville Smart Oven is that it gives you high quality cooking results as well. When you start looking at Breville Smart Oven reviews there’s a lot to compare. I’ll try and compare the most similar models together so you can see the differences more easily. The Mini Smart Oven BOV450XL and the Compact Smart Oven BOV650XL have a lot of similarities but there are a few differences that are worth noting. ⇒ Click the Image to see the price on the Breville Mini or Compact above. Size: The most obvious difference is the size. The outside dimensions of the Mini are 16 x 14¼ x 8½ (W x D x H inches). The Compact dimensions are 17 x 15 x 10 (W x D x H inches). Capacity: Breville Mini Smart Oven is 0.45 cubic feet and the Breville Compact Smart Oven is 0.6 cubic feet. Pizza: The Mini can cook an 11-inch pizza and the Compact can take a 12-inch pizza. As you can see there aren’t many differences between the Breville Mini Smart Oven BOV450XL and the Breville Compact Smart Oven BOV650XL. But for some people the outside dimensions will be very important and might make the difference between being able to fit it into an appropriate space in your kitchen or not (this may be the exact reason you’re looking at Breville Smart Oven reviews!). In particular the height difference of almost 2 inches may be important where space is limited. Breville recommends that you leave room at the sides and top of your Smart Oven to allow for ambient heat to escape. These ovens are not intended to go into a cupboard or under your counter. They need to sit on your counter. For this reason, the Breville Mini Smart Oven offers you a good option if you need the smaller dimensions. At the time of writing, the Breville Mini Smart Oven was cheaper than the Compact version. However, if you need to cook a 12-inch pizza you should definitely buy the Compact Smart Oven because the extra cost is only a few dollars and when you amortize that over the next few years of using your oven, it won’t amount to much. I know it sounds trivial to comment on the difference of 1-inch on a pizza but if you like to cook pizza at home you’ll understand how important that 1-inch can be! When you’re looking at Breville Smart Oven reviews, it’s worth looking at the size of pizza you can fit in each. ⇒ For a good price on the Breville Smart Oven BOV800XL, Click Here. When you’re reading Breville Smart Oven reviews you really need to compare these two ovens together. The latest model, the Breville Smart Oven Air BOV900BSS, offers more features than the others but it is also the most expensive. While it’s nice to have the best, you don’t always need to spend on the biggest and most expensive. If you’re considering the Breville Smart Oven Air then you should also take a look at reviews on the Breville BOV800XL and the BOV845BSS. These Smart Ovens have a lot of similarities but there are two main features that set them apart. This is the reason you need to read Breville Smart Oven reviews before you purchase. One or both of these features could make a big difference to which model you choose. The first one is a deal breaker for me. It’s the oven light. I love being able to easily look into the oven without opening the door and see what I’m cooking. This is really useful if you’re going to use your Smart Oven for baking. I like to see how my cake is rising (without opening the door!). 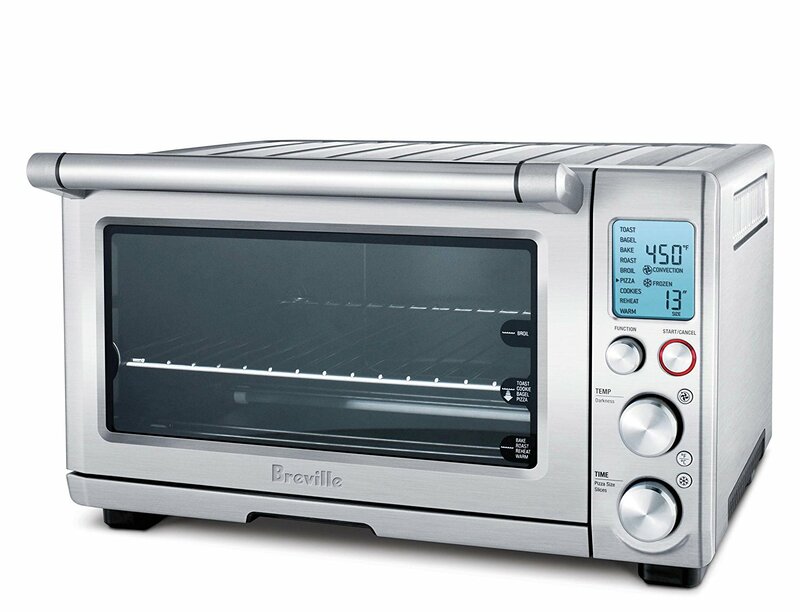 The Breville Smart Oven Pro BOV845BSS has an interior oven light that uses a replaceable 24W, G9 bulb. The second feature which sets the two apart is the slow cook function. The Breville Smart Oven Pro BOV845BSS gives you the choice to slow cook on two heat settings from 2 to 10 hours. At the end of the set cooking time it will switch to the keep warm function automatically. When using the slow cook feature, Breville recommends keeping the lid on to stop your food from drying out. You can also cover the cookware with a piece of aluminum foil before placing the lid on to keep even more moisture in. Cooking settings: the Smart Oven BOV800XL has 9 settings and the Smart Oven Pro BOV845BSS has 10 (the extra setting is slow cook). Interior oven light: on the Smart Oven Pro BOV845BSS only. Slow cook function with automatic keep warm setting: on the Smart Oven Pro BOV845BSS only. There aren’t many differences between the Smart Oven and Smart Oven Pro but they are significant. Personally, I’m a big fan of having an oven light. If you feel the same way, definitely get the Breville Smart Oven Pro (or the Smart Oven Air, see below). And the slow cook function could be a deal breaker too. What’s your style of cooking? Would you use the slow cook setting at least once a week? Does it provide you with the convenience of having dinner ready without rushing at the last minute? When you’re looking at Breville Smart Oven reviews you also need to assess your own cooking style. These are personal choices that may make your buying decision easy. If you’re looking at Breville Smart Oven reviews, it’s possibly because you’ve read about the high-end Breville Smart Oven Air. The Breville Smart Oven Air BOV900BSS offers a lot more features than any of the other Smart Ovens. It is also more expensive but you’ll see why when you read on. Due to its cost, the Breville Smart Oven Air won’t be for everyone. But if you want a counter-top oven that can do almost everything, this is the one for you. This Breville Smart Oven Air new model is substantially larger and heavier than the other models featured in these Breville Smart Oven reviews. The weight is 33 lbs (compared to the Smart Oven Pro at 22 lbs). The external dimensions are 21½ x 17½ x 12 ¾ (W x D x H inches). In comparison, the Smart Oven BOV800XL and the Smart Oven Pro BOV845BSS both have external dimensions of 19½ x 15¾ x 11 (W x D x H inches). LCD color changing display is larger, 3 x 2½ inches. 8 rack heights by using 4 grooves with the ability to place the rack facing upwards or downwards giving you the choice of 8 different rack heights. There are several stand-out features on the Breville Smart Oven Air, like the air fry capability, the proof function for rising dough and the dehydrate option. But the differences actually go beyond these extra functions. There are lots more advantages offered on the Smart Oven Air. To really benefit from these Breville Smart Oven reviews, I’ve compared similar models to each other. Here is the Breville Smart Oven Air compared to the Smart Oven Pro. When comparing the Breville Smart Oven Air vs Pro, let’s start with capacity. Breville Smart Oven Air has 1.0 cubic foot of interior volume versus 0.8 for the Smart Oven Pro. In the Air there are 8 different rack height positions whereas the Pro has 3 heights. The Air fits standard quarter baking sheets and larger casserole dishes up to 16 inches wide but the Pro is smaller. The Air has an extra upper Quartz element making 6 elements total in comparison to the Pro which has 5 elements, two lower and 3 upper. You can toast 9 slices of bread in the Air while the Pro does 6 slices. The Air has an air fry feature and includes an air frying basket while the Pro does not – this is great for making crisp fries or wings. The air fryer is one of the best known features when comparing the Smart Oven Air vs Pro. The Air can dehydrate food like herbs, fruit or jerky. A customizable Phase Cook feature is included on the Air so you can run two cooking modes back to back. The slow cook function on the Air runs for longer times than on the Pro. The Air Slow Cook Lo setting runs for 4 to 72 hours and on Hi runs for 2 to 12 hours. In comparison, on the Pro the Slow Cook Lo runs for 4 to 10 hours and on Hi from 2 to 8 hours. A super convection fan setting is available on the Air to crisp your food better. In the Air the light comes on and the timer pauses automatically when you open the door. There’s a proper silicone seal all around the door on the Air to help seal in the heat and moisture. On the Air there’s a rotate reminder to remind you to turn your pans half way through cooking. You can adjust or silence the beep on the Air. On the Air you can leave the door open a few inches without it slamming shut on its own. On the Air there’s a fan to take in air from the room to cool the electronics panel. This may keep operating after the oven has stopped. While some people don’t like the sound of it running, it gives me peace of mind. I also have these fans on my kitchen oven and my induction cooktop. They are important because they cool the electronics and extend the life of the appliance. That’s why I like hearing them on my kitchen appliances! When you’re looking at Breville Smart Oven reviews it’s easy to see why the Breville Smart Oven Air is so popular. But all those features do come at a price. If you need these features I recommend you buy the Air. But don’t think it’s all or nothing. The cheaper Breville Smart Oven models still offer superior cooking results and great features. Sure, you can compare the Smart Oven Air vs Pro but you should also look at the other models too. If you love the oven light feature but you you think the Breville Smart Oven Air is a bit pricey, then opt for the Smart Oven Pro. When you’re comparing the Smart Oven Air vs Pro it is all relative – they’re both high quality smart ovens. The Air is the latest and greatest but the Pro is still an amazing smart oven. 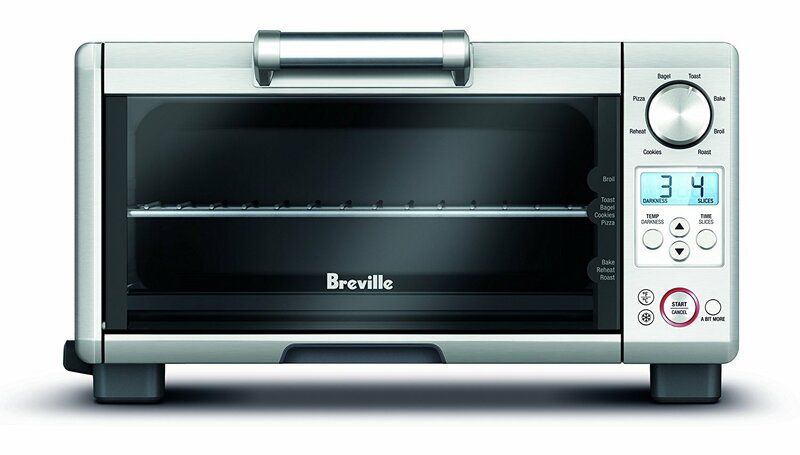 If space is limited in your kitchen choose the Breville Mini Smart Oven or the Compact Smart Oven. They both offer great features at a really affordable price. When you’re looking for the best bang for your buck, the Smart Oven BOV800XL really is a good counter-top oven. It offers many similar features to the Smart Oven Pro BOV845BSS but without the oven light and slow cook function. But…just a word of warning if you’re thinking of buying the Smart Oven BOV800XL, always check the price of the Smart Oven Pro BOV845BSS at the same time, because if it is on sale the price may be close to that of the BOV800XL. Breville Smart Oven reviews can be deceptive when you only look at a few features on one or two models. Before you make your buying decision, consider all the features on each model compared to the others. As you can see, the Mini and Compact have a lot of similarity. And the Smart Oven and Smart Oven Pro are also similar to each other. All the features overlap to some extent but if you really want to replace several different kitchen appliances with one counter-top oven then the Breville Smart Oven Air is the model for you. ☑ Do you love convenience in your kitchen? Need an Instant Pot? Read more here. ☑ Love eating fries at home? Perfect fries are easy in a Philips AirFryer. Read more here. ☑ Have you tried an Induction Rice Cooker yet? Be amazed at the results. Read more here. This entry was posted in Small Appliances on January 7, 2018 by Edwina. 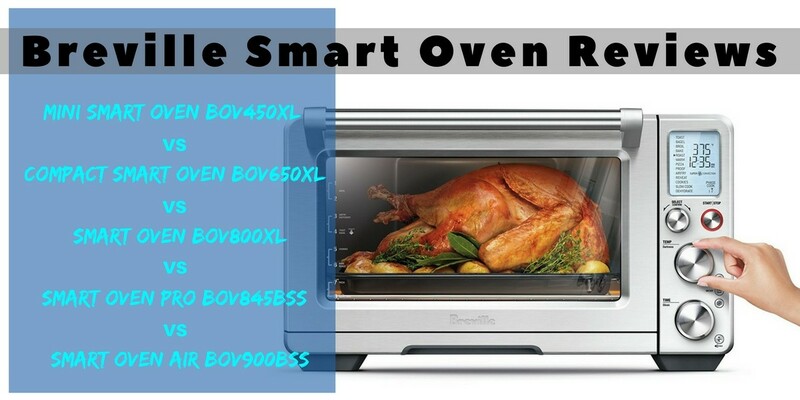 This article was very informative and it gave me a lot to think about, even if it did not cover Smart Oven plus BOV810BSS which has the same MSRP as the BOV800XL. The plus model comes with slow cooking. However; I checked prices at Amazon and then through Google search and found the Smart Oven Pro on sale for $215.99 with free shipping at best buy. Thanks for stopping by Richard. I’m pleased the information was helpful. Well done on finding a good price too! Be sure to visit The Equipped Cook again, there are lots of new reviews coming soon. The Breville mini gets very hot on the sides and top. The Delonghi doesn’t get so hot you can’t touch the sides. Only the top can get hot, but not as hot as the Breville. Why isn’t the Breville insulated better?